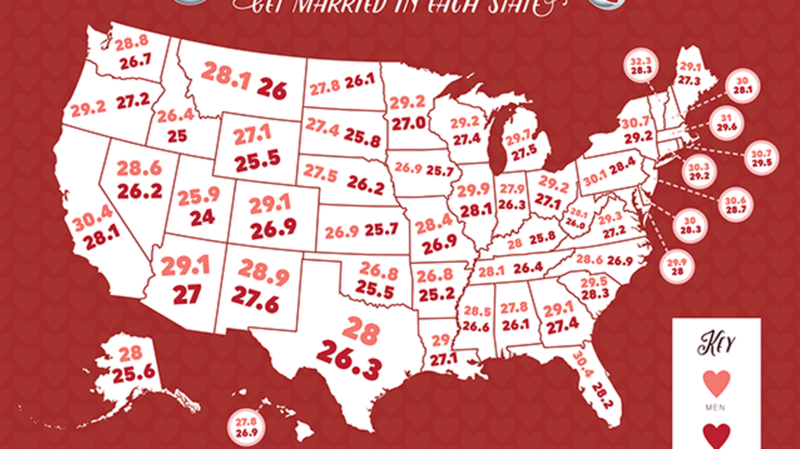 At What Ages Do People First Get Married in Each State? Everyone has opinions about the proper age for getting married (hi, mom). And while there’s nothing sillier than subjective notions of what’s “normal” in nuptials, there are cold hard facts about what your fellow citizens are doing when it comes to happily ever after. We tracked down the median age of first marriages among men and women in all 50 states with data from 2013’s annual American Community Survey. The numbers show that most first weddings occur between ages 26 and 30—no surprise there—with Utah putting up the youngest ages for both men and women (25.9 and 24, respectively), Vermont has the highest median age among men (32.3) and Massachusetts has the highest among women (29.6). Take a gander at how your state stacks up. It's not quite the same as comparing friends' wedding photos on Facebook, but it's a lot more factual. The Afternoon Map is a semi-regular feature in which we post maps and infographics. In the afternoon. Semi-regularly. This one was made by mental_floss' designer, Chloe Effron.